I’ve really gotten into soup lately. Or maybe it’s simply because it hasn’t been until recently that I discovered what soup could really be. Like most of us, I was a happy child of Campbells tomato soup and bean with bacon, I wasn’t aware the nuanced and sophisticated flavors that can exist in a soup. 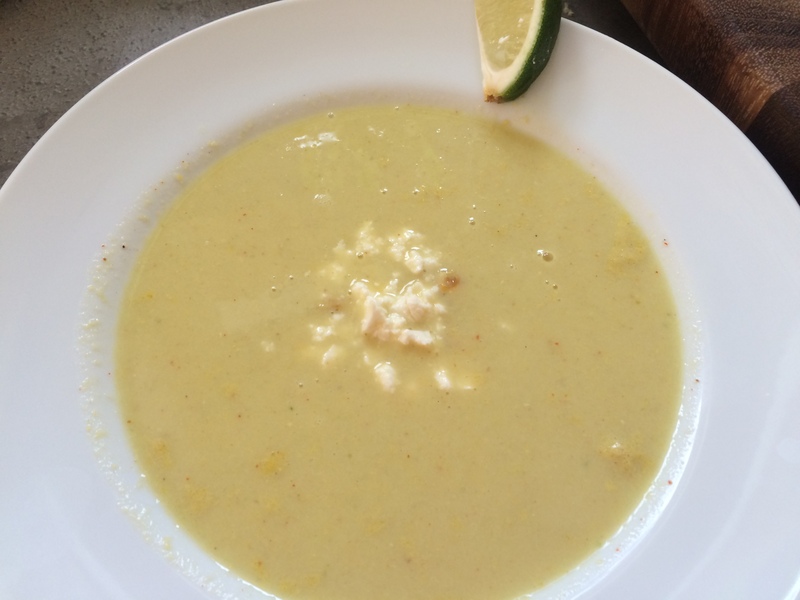 Enter velouté – a French term for soup that translates to “velvet.” This is that soup that has a slightly creamy, smooth — almost broth-like – consistency. It seems simple until you take a sip and are smacked with a real punch of flavor. 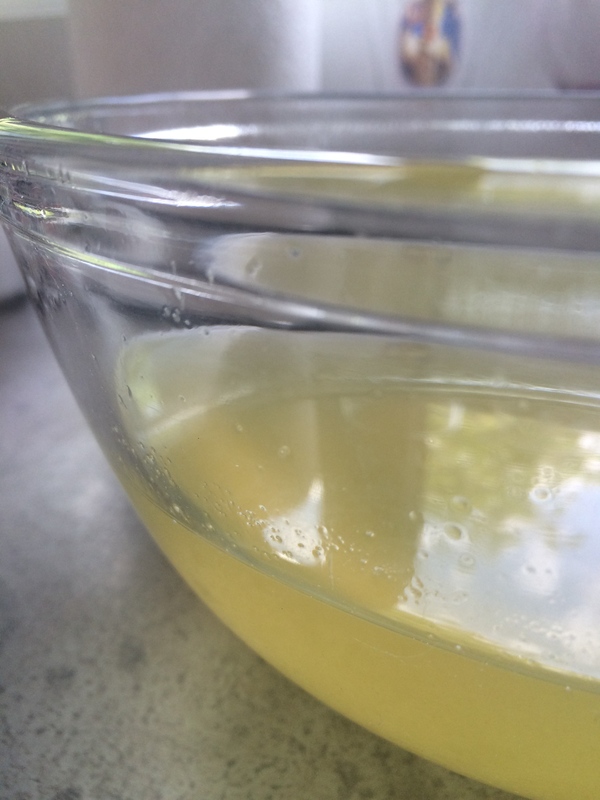 The basic technique for any velouté is the same: make a simple stock from the scraps of your ingredients. Sauté main ingredients and simmer in broth. Add cream and puree. Strain through mesh sieve. I decided to play a little and use this technique with the flavors of Mexican street corn. Street corn is grilled corn that is then rolled in a sour cream/mayo mixture and then rolled in cojita cheese and cayenne pepper. It comes with a wedge of lime and is sometimes sprinkled with cilantro. It’s spicy, sweet, crunchy and smoky. Here’s how I got it all into a soup. Ingredients assembled. This is for about 4 servings of soup — and a good broth ratio is about 2 cups of water for each ear of corn. 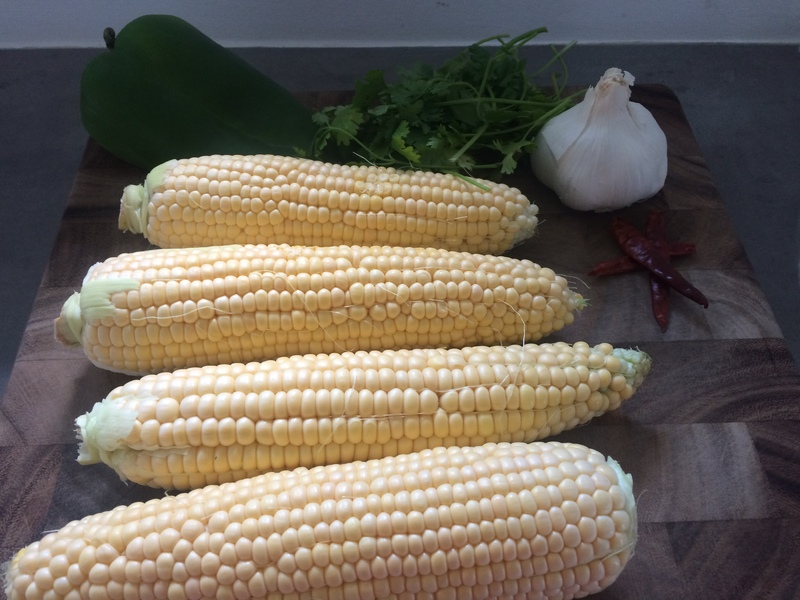 Pictured here: sweet corn, dried hot pepper, garlic, cilantro, poblano pepper. In my final recipe, I omit the dried hot pepper as I think it makes the soup just slightly too spicy. You will end up with a light yellow, clear broth. Blend soup, infuse with cilantro and strain. Garnish with some sauteed corn kernels and cojita cheese. Serve with a lime wedge. 6 cloves of garlic– 4 smashed for broth and the other 2 minced and set aside. While the stock is going, prep your other ingredients: slice the poblano and onion and dice the other 2 cloves of garlic. Set some corn kernels aside for garnish. On a medium heat, add 1 tablespoon of butter and wait until it’s foamy. Add the corn, onion and poblano and slowly saute until the onions are translucent but not brown. Add the garlic and cook a little longer until fragrant. Add the stock to this mixture and bring it to a boil. Then reduce to a low simmer and cook for 25 minutes. After 25 minutes, add cream to the pot. At this point, you will puree the mixture. You can either blend in a blender in several batches OR (my preference) use an immersion blender. Just make sure you get it real smooth. Turn off the heat, but leave the pot on the hot burner. Return the pureed mixture to the pot. Take the cilantro and bruise it up with the handle of your knife–you should be able to smell the cilantro in the air as it releases its scent. Add this to the soup and let it infuse for 30 minutes. Going about 3 ladles at a time, strain the soup through a mesh sieve. Press on the solids to release as much liquid as possible. Taste and season. 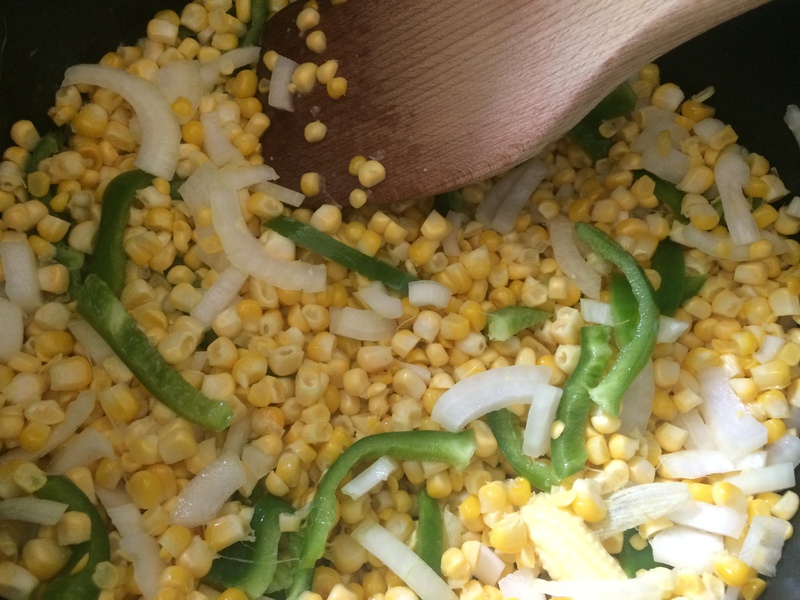 The sweetness of the corn will dictate how much salt it needs. Add some pepper, cayenne to your heat preference and a sprinkle of chili powder. 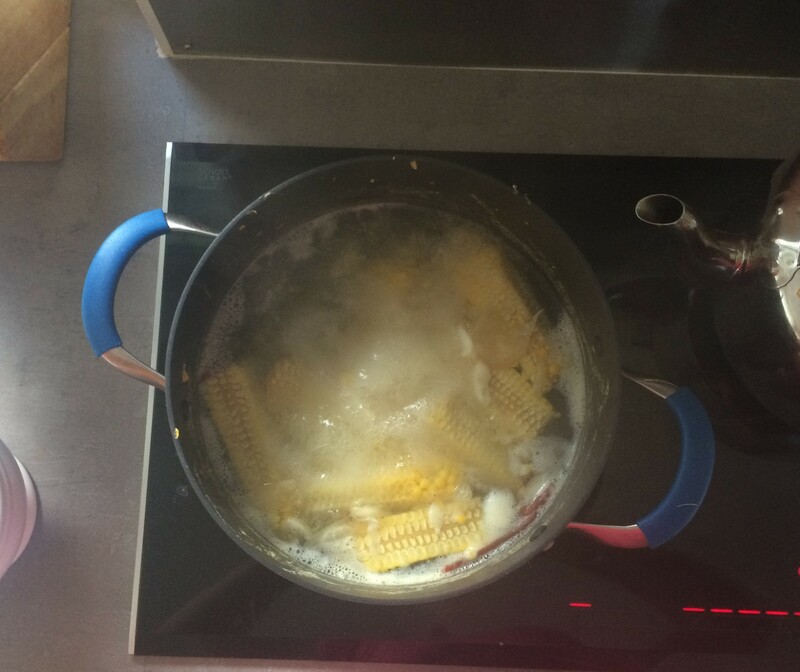 Saute the reserved corn kernels in butter until browned. Pile these in the middle of your bowl and ladle the soup around. Sprinkle cheese on top and serve with a wedge of lime.